Created for commercial use in autodose machines, the Horizon Light 10l offers a gentle clean. Designed to deliver high performance on a wide variety of stains and soils, it can effectively remove everything from blood to food stains. The low PH makes it suitable for delicate fabrics with a biological formula that cuts through stains without dulling colour or affecting softness. 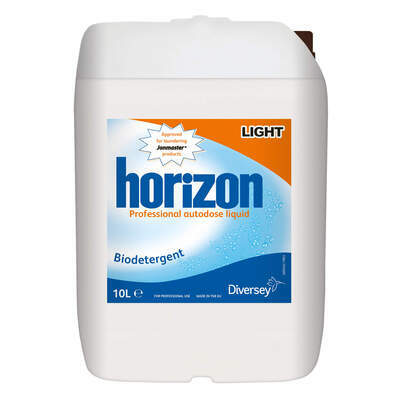 Supplied in a large 10 litre bottle, this Horizon product will provide a large number of washes per bottle making it an economical option for all business sizes. Here at Gompels, we have a wide range of laundry detergents available to suit every need and budget. From our own brand Heavy Duty Low Temp Stain Remover through to the Ariel Autodose, you'll find the right product for you at a price that fits.